Bugles stuffed with peanut butter, dripped in melted chocolate. Every time I open a bag of Bugles I always think, "Man, I'd love to pump these full of peanut butter and dip them in chocolate." Which is more proof that I spend WAY too much time thinking about recipes. So when I saw a display of Bugles at the store yesterday day I decided that was exactly what I would do. I should warn you though, husbands and onions can't keep out of them. These babies are da bomb... for realz. Cream peanut butter and powdered sugar together with an electric mixer until creamy (about a minute). Fill a piping bag or plastic zip-top bag with peanut butter mixture (if using the zip-top bag, snip a small hole in one corner - I had better luck with just a plain ol' zip-top bag). Pipe the peanut butter mixture into each Bugle until just full. You won't be able to use all of the Bugles because some are duds with flat openings but it's OK, you'll have enough good ones. 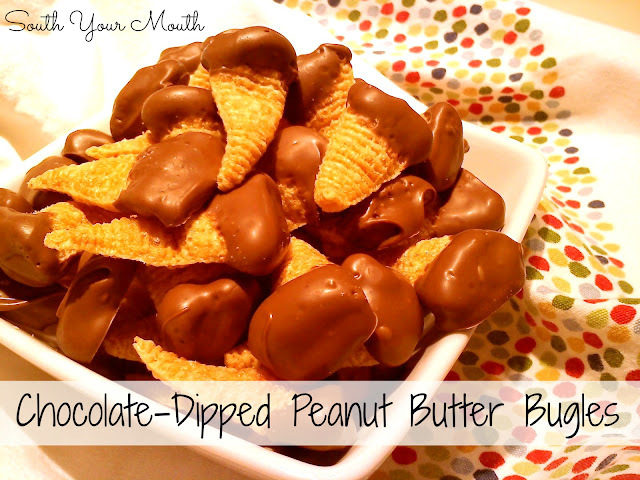 Melt the chocolate chips and dip the open ends of the stuffed bugles into the chocolate. Set each on aluminum foil or parchment paper for several hours or until chocolate is firm again. Store in an air-tight container (or else the Bugles will get stale). Saw you on Country Cook Weekend Potluck - wow these look so good - and I'm a Bugle lover from WAY back. Can't wait to try them. My mom dips them in white chocolate and then sprinkles! Makes little mini ice cream cones! My onions love them! I just found this blog and it makes me truly Lol!! And that takes a lot!! Keep up the great work!! I did these with white chocolate at Christmas time and then dipped the tips of the bugle as well and made them look like little Santa hats. Very cute and tasty, sweet, salty snack all in one! I liked them.